I cannot rap. I know that not because I have tried and failed but because I have never tried and am certain that if I did, I would fail. 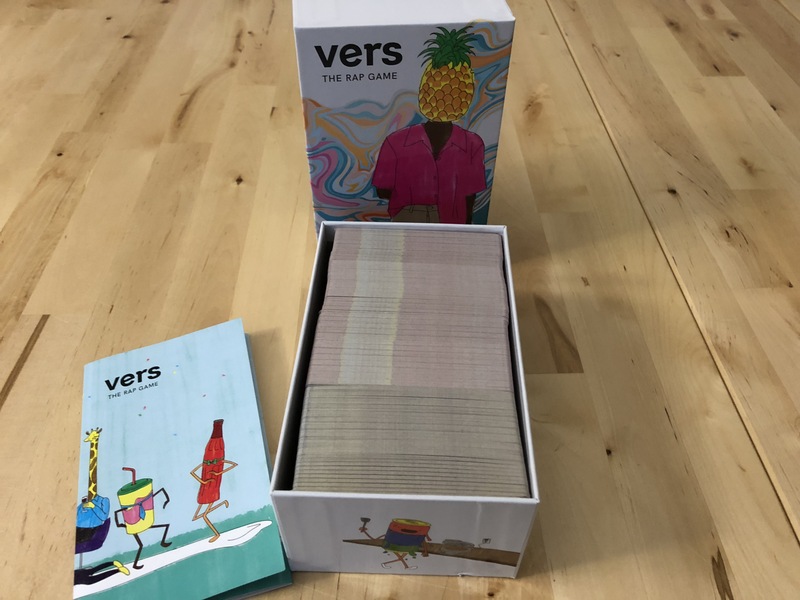 So I was somewhat skeptical that VERS, a game that claims to make it possible for anyone to string a verse together using a series of carefully constructed cards, would actually work. The game, developed by Jerry Spatch is a love letter to hip hop culture, from the particular style of its artwork to the mission statement of its designer. 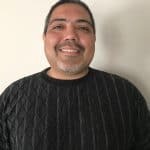 I like everything about the presentation, and was eager to see if it was in fact a fun party game, even for people who, like me, get clammy when they have to stand in front of a group of people and recite their name, let alone think of something creative on the fly. Fortunately for me, the game’s promise is mostly kept. It’s swirling with colors and ideas, and seems so simple in its execution, but like the perfect writing prompt in middle school, it taps into the innate creativity we all carry inside – whether we use it daily or haven’t dusted it off for 20+ years. 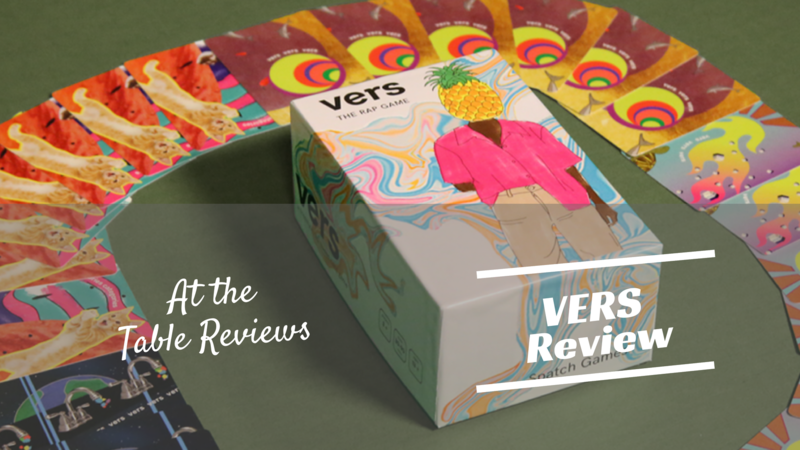 VERS isn’t significantly different than other party-style card games you might see on your local big box store shelf, or on Kickstarter every month. But unlike those other games VERS attempts to bridge a social and generational gap that others cannot with words alone. 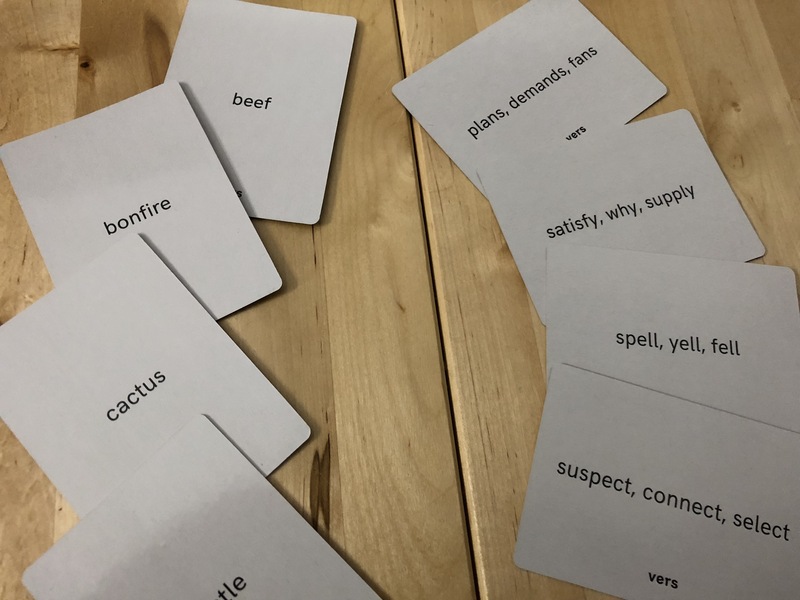 In the game, players are tasked with stringing together a combination of categories and base cards to craft a freestyle rap. An example used in the rules is a category card consisting of “taco” and a base card that has: “hate, great, appreciate”. 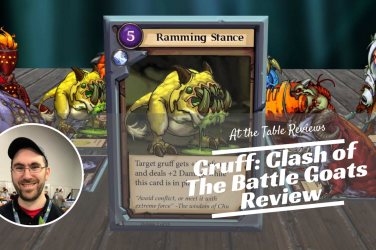 Other players will then vote on the different raps to decide which one they think is best, both in quality and in matching the category card, similar to most other card games with a voting element. 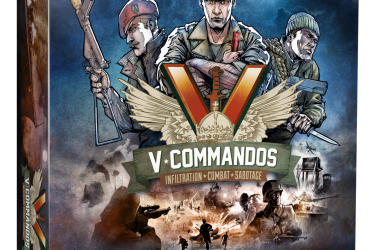 The entire process takes about 10 minutes per player, so it can be as short as a 30-minute game or as long as several hours if you have a big group of people all participating. 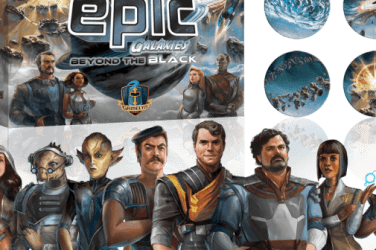 The box comes with more than 400 total cards, and some appropriately eclectic artwork, and when considering the different combinations of cards, there is a lot of replay in the box. VERS is designed so that anyone can freestyle rap – giving them the building blocks needed to craft something that rhymes and is thematically linked. It claims anyone from 7 to 70 can do it, and I can see how that would be the case. 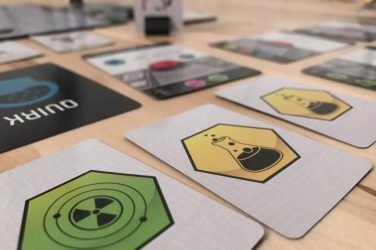 It’s sleek, simple as most other party games in this genre, and offers a huge chunk of content in an attractive package. Several games lasted well beyond the printed time, because people had fun digging in and looking for new and fun combinations of category and base cards with which to craft their raps. 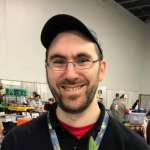 It was quick to teach, and while a lot of people were hesitant at first, most were able to participate within the first couple of rounds without any issues. As I said, most could craft the raps and had fun doing it. Unfortunately, there are some people who had a lot of trouble. VERS, unlike Apples to Apples or Cards Against Humanity is more of a storytelling game. Whereas those other games give you a handful of cards to choose from each time you complete a sentence or answer a question, VERS gives you two cards that pair together. Giving people multiple base cards is certainly an option, but the element of creativity remains, and in a heavily social setting, some will balk at it. Is this a problem with the game? Not at all. Games like Snake Oil or Rory’s Story Cubes require similar creativity and interactivity, and some people just don’t like that. What it does mean, however, is that some people – those who are musically inclined or who have freestyled in the past – will take to VERS much faster than everyone else at a table. I personally struggled for several rounds to string a rap together without stumbling on it. Once I started to get the hang of things, though, I was delighted to find myself crafting fun, if not amazing, lines. VERS is a good game. 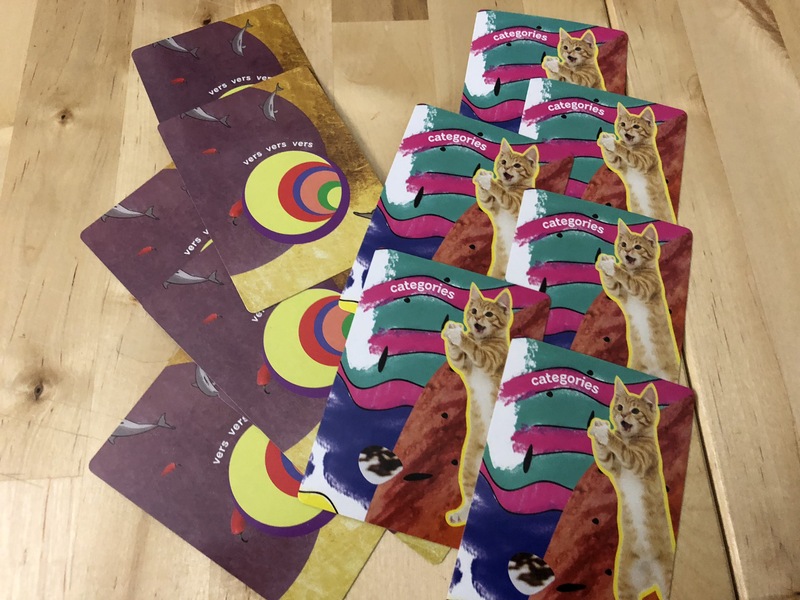 It’s a box full of cards, no different than a hundred other party games flooding the shelves at local big box stores (and Kickstarter in an effort to get there), but there are three reasons why it is better than those. 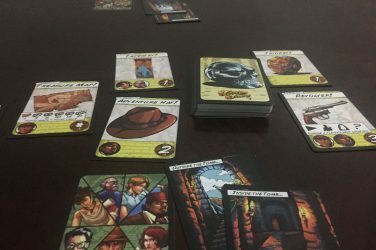 First, it’s a new idea – sure it’s cards and ideas, and a bit of light voting by the players, but the way it forces you to think and create connections between words is unlike anything I’ve played before. Second, it’s nice to look at. The graphic design is spot on for what you’re crafting, and it’s attractive to people standing a table or two away. Finally, it’s accessible. The game doesn’t set barriers that the players can’t overcome (with a few exceptions). It takes a couple rounds to get into the flow, but once you do, it really works. 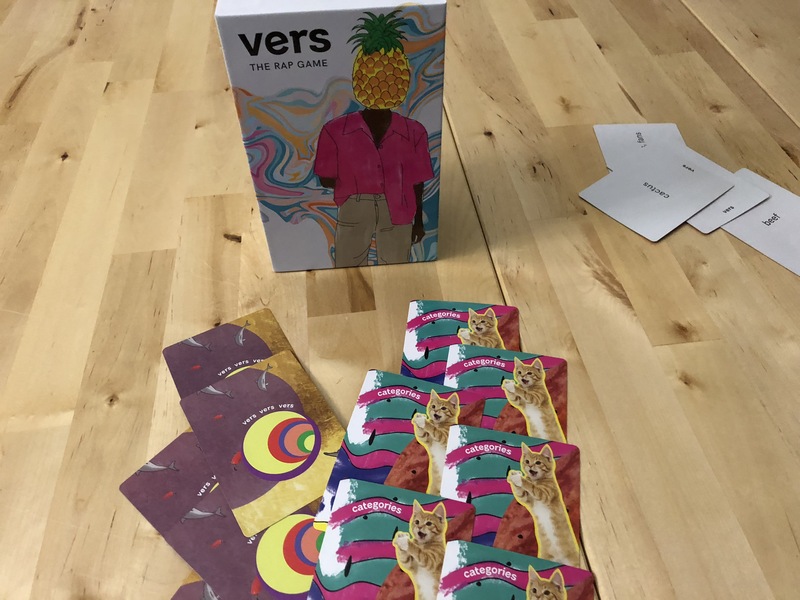 If you are looking for a fresh, new take on creativity-based party games for your family and game groups alike, check out VERS.